This Westfield, NJ home designed by New York-based duo Brian Humphrey and Dan Mazzarini of BHDM Design is all about the sun and the sand!!! I wouldn’t mind kickin’ my feet up and spending my summer here that’s for sure. 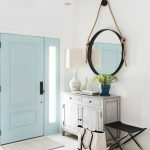 I think my favorite is that first image of the mudroom…I love that corner bench and split door! Not to mention the perfectly aqua-hued walls! See more of the home and other very cool interiors over at the BHDM website! Did you have a good long weekend? You got me on the 1st picture. This is a FABULOUS post, Erin! I'm in love with this place. So, so perfect! This is a gorgeous house, with a bit (okay, a LOT) of that Something's Gotta Give vibe, which I adore. perfect pics to go with my cup of tea this morning! I can always count on your blog for some great morning inspiration!! Thanks girl!! I love that front picture, the farm door, the bench, the blue! So pretty. The first few pictures took by breath away! 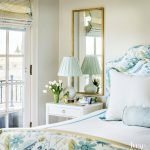 Love the pretty Tiffany Blue and white, with just little dark accents. 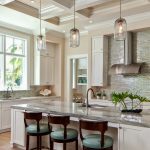 It is a fantastic home and It has me in the details. I love the coffee table and the blinds in the huge living room. The beautiful blues they picked. Fabulous, Erin! Thanks for the introduction to this team of designers. The house is divine! OMG this is one of my fave's for sure. You are right that mudroom is amazing!!!!!!!!!!!! Oh Erin I do love these images!! really INSPIRING! This house is wonderful.. I have been debating the oil rubbed bronze for our house project.. I love how it looks here with all the white. Just perfect! Thanks for posting! Just gorgeous!! I love that entry way!!! ALOT!!!! Wow is this place ever gorgeous! LOVE! I'd be bummed if we had a mudroom this awesome because it would inevitably be completely covered in mud! The blues are absolutely beautiful. I don't think there's a better color to create warmth and atmosphere. Hubba, Hubba! I love the corner bench an split door! Totally love all the light shades. And the pillar that leads to the stairwell. And the kitchen. Great house. For me, I fancy the living room on the second to the last photo. It reminded me of my home when I was growing up in Florida. Just by visualizing the living room, you can sense how cozy, relaxing, and comfortable it is. 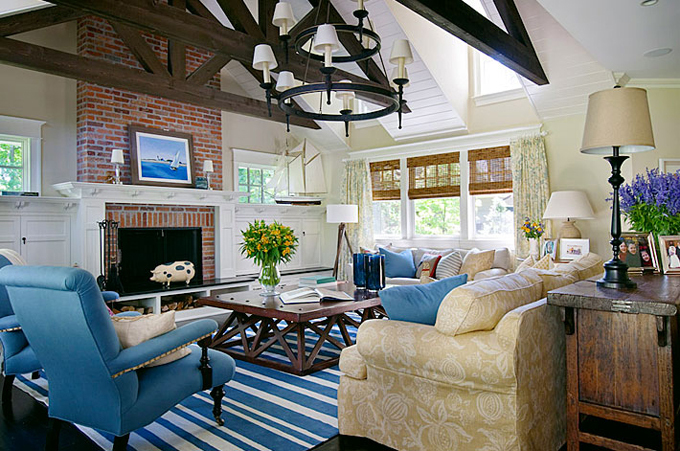 I love its furniture sets especially the blue chairs and pillows. This is a big living room. Perfect for family gatherings this summer. ADORE the mismatched chairs in the dining room…I think that's a trend that is here to stay. Love this post. Love, love, love is all I gotta say. 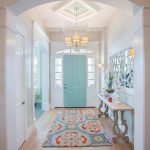 This first image with the bench and the dutch door got me. Love all the details in this home. It's a keeper in my inspiration files. Thanks for sharing this. their colors and decorations are beautiful!